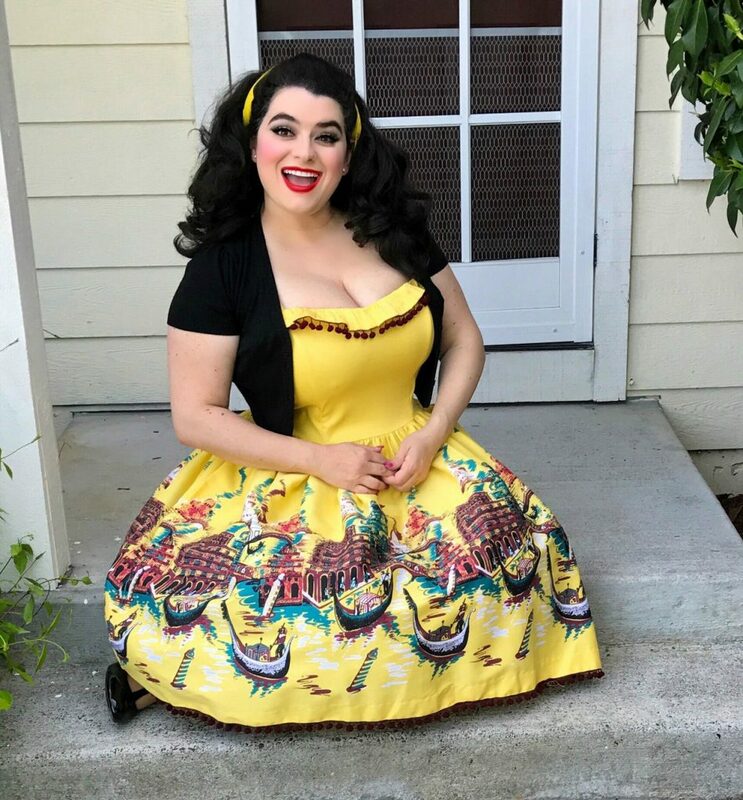 La Dolce Vita – Pinup Girl Style!!! Not just anyone can create a dress that has fit; flare and a bombshell silhouette that makes the wearer feel like a Femme Fatale. 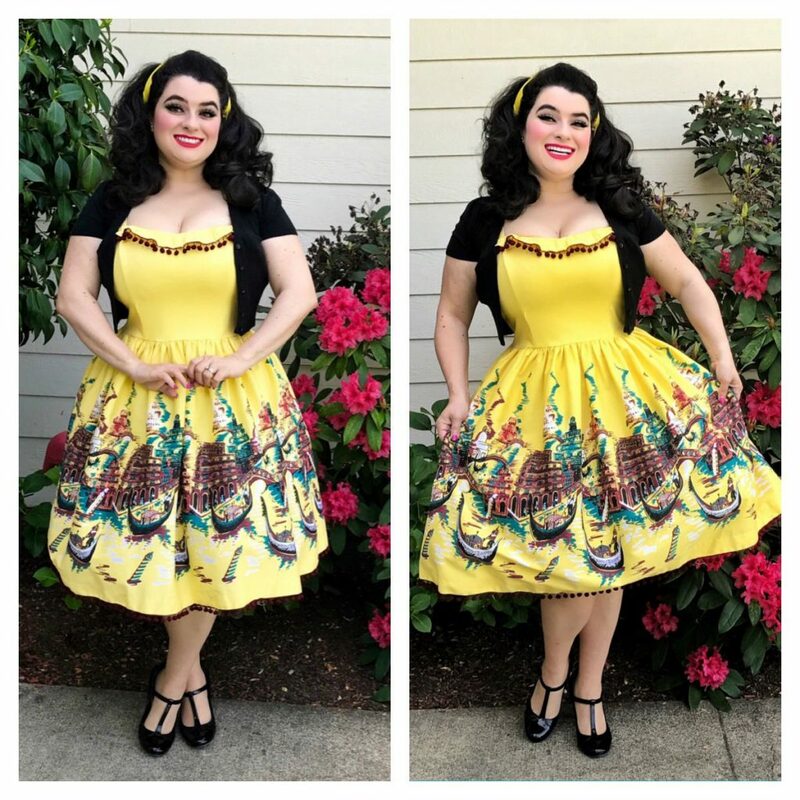 Pinup Girl Clothing knows how to exquisitely create such a dress and it is called the Bella Donna Dress in Yellow Italian Landscape under the Pinup Couture label. I find the yellow color to be perfect, reminds me of sunny days on the Italian Riviera. The dress has a gorgeous boarder print of Venice complete with Gondolas and Palazzos. The teal color adds the essence of water from the canals. The details on this dress are so pretty and there is an extra pop of drama by having a row of burgundy pom-poms along the ruffled neckline and along the skirt hem. I find these pom-poms unexpected and delightful… just like Venice. Let us talk about fit now. 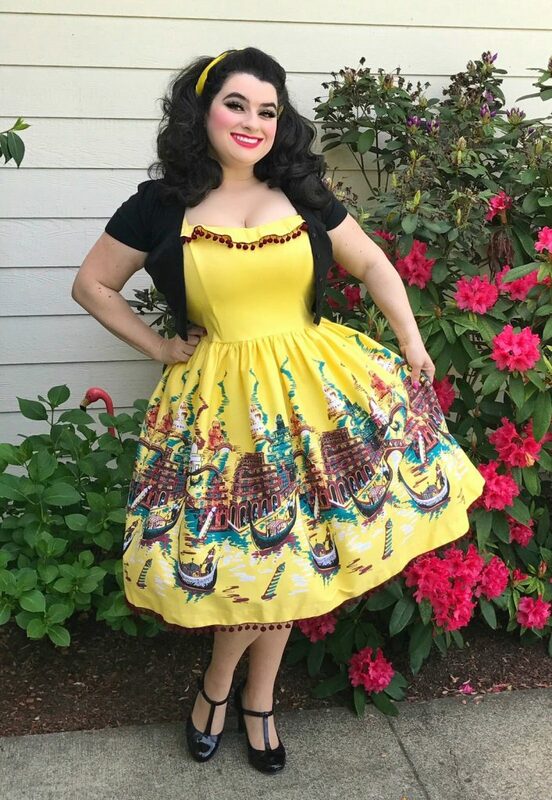 I am a long-time devotee of the Jenny dress and was hoping the Bella Donna would fit somewhat like it. I had never owned a Bella Donna before. I was worried about sizing, I wanted my curvy top-half to fit into the dress and liked that the Jenny could accommodate a full bust. I opted for a size 2XL as I do in the Jenny so that my bust would fit knowing the waist would be loose. I usually belt the waists of my Jenny’s. I found the sizing chart to be accurate in my case. The Bella Donna is also cut a little different around the waist, it has a little bit of a shorter waist and I found it to fit really nicely. My waist is enhanced and nipped in. The dress is also fully lined and boned like the Jenny so it holds its shape and is very comfortable. The fabric also has a bit of stretch to it. It also has adjustable straps!!! And, the straps are a little bit wider than the straps on the Jenny so full busted gals can get away with wearing a supportive bra. The Bella Donna is a flirty dress with loads of glamour and effortless chic. I couldn’t wait to put my Bella Donna dress on and my wonderful hubby Gary shot some pics of me in the dress. I am wearing a petticoat underneath; I like the fullness it adds to the skirt. It was a cool windy day with the sun coming and going so I added a cropped black cardigan (I have since gotten a teal cardigan and I think it will style beautifully with the dress). I did not find any trouble with the pom-poms laying flat with the cardigan on. Add your favorite Pinup Couture handbag and your outfit is complete. Guaranteed compliments will be coming your way!! Hurry and snapped up your Bella Donna, this one will sell out quickly!! It also comes in a Jenny skirt and Petite Jenny skirt! !